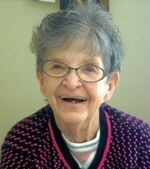 Doris Laycox Obituary - Seaforth, Ontario | McGlynn Family Funeral Home Ltd.
"Love you forever, miss you for always, as long as I'm living, my grandma you'll "
"Thinking of you at this time. Keeping you my prayers. " Doris passed away peacefully at Stratford General Hospital on Saturday, April 28, 2018. Born in Cochrane, Ontario, on August 13, 1936, Doris Margaret “Dolly” Laycox (née Baker) of Clinton, was in her 82nd year. Loving mother of Rodger Laycox (Lisa) of Clinton, Royce Laycox (Patty) of Stratford, Kelly Laycox, and mother-in-law of Teresa Laycox of Seaforth. Cherished grandma of eight, great-grandma of thirteen and great-great-grandma of two. Predeceased by her husband Earl Laycox, son Harry Laycox, daughter-in-law Joanne Laycox, and her parents William and Annie Baker. A private funeral service is being held at McGlynn Family Funeral Home, Seaforth, 519-527-1390.